I have a new problem. Not sure if it is new with the last update or not, but I can't sort any more. I have been using the program to reset my DSON files, however, after leaving the PC for an hour and returning I now get this error when checking for the DSON files. I had used it successfully until then and still had some left to go. Any ideas? Your logon checker works fine on my end. The History Manager just gets better and better. I reset a bunch of DSON files so off to check to see if it worked. Oh yes, it worked like a charm! I did it yesterday, found 184 files to download and with your downloader I had them on my computer within half an hour! I suppose it wasn't DSON files (products/items), for currently there is only 103 of these? But yes, the Evolution Morphs and Ethnicity Bundle do have DSON updates. 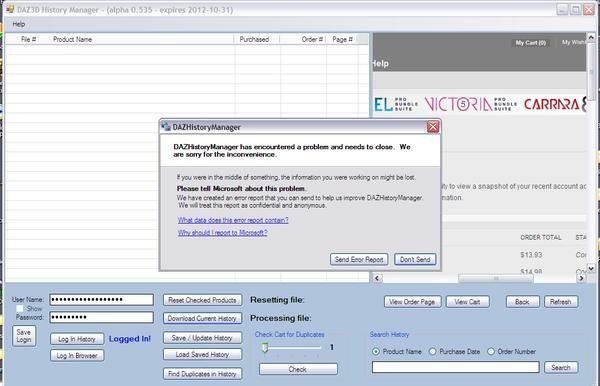 The program will not list any other products than those with DSON updates when using the DSON checker. You can find the current list of DSON updated products in the "DSON_list.txt" file in the "data" folder inside the program folder. It will be updated whenever you run the DSON check. What's wrong with zip files? And the progress bar that keeps on running is a bug. Doesn't affect anything else really but if you want to get rid of it, restart the program or run the Cart Check. The Evolution morphs, Muscularity, Ethnicity, and Iconic Shapes do not have presets that appear in the library (in either DS or Poser). They only show up as dials when you load Genesis. So they are usable in Poser without needing updates or Poser Companion Files. OK, but they are listed on the DSON page anyway. Yes, they are listed and are compatible, but don't have (or need) Poser Companion Files. OK, thanks. I will wait for the page to get sorted. No, apparently not. For correction and clarification then: the History Manager lists all the products on the DAZ DSON page, whether they include Poser Companion / DSON Core files or not. Thanks for the continued updates, this really is an indispensable program for me right now. ...currently logged into the store site. When I fire up the History Manager it asks me to log into my browser again even though I currently am. Also it doesn't seem to save the username/password for the Daz site login. Is there a fix or any workaround for this without having to manually key it in every time? Not sure if I remember the original password as FF keeps it for me. ...update, figured out the old password but every time I try to download the current history I get a Windows crash error. Not when you start History Manager, only when you use features that require browser login, right? The browser in the program is a clone of the IE on your system and inherits its settings, therefore they may interact and share the same login (I believe they use the same cookie). It seems though that this is not always the case, sometimes you have to log in seperately in the browser in History Manager, even if you're logged in in IE. As for other browsers, like FF, theres no login sharing with History Manager though, just like you're not automatically logged in if you start FF, even though you're logged in in IE, and vice versa, because they don't share cookies. It's for the same reason there is both a History Login and a Browser Login in History Manager. The history download code is not connected with IE in any way and therefore needs a separate login, which uses its own private cookie. In general there's no need to worry about all this, whatever program you're using just log in, if it says you're not logged in. You have to type email/password into the fields in History Manager and then click the "Save Login" button, to save the login. It cannot import the login from FF or other programs. After you have saved it, you don't need to type anything in anymore. Login data are saved encrypted in the file "login.dat" in the "data" folder inside the program folder. If you are unable to find your current password, you can reset it (click "Forgot Your Password?" on the DAZ login page). You're using an older version, which is no longer compatible with the DAZ site, that's why it crashes. It should offer to auto-update though when you start it, doesn't it do that? I've just tested the same version here and it does show the auto-update box as it should. ...well it saves the login info for the History Manager OK just not for the browser window. That is where I have to manually key everything in. I don't use IE because of it's poor track record with security issues. ...as to the crash when downloading the history file, not sure why that is happening. Could there have been a recent update that I missed perhaps? ..ach! Because it mentions DSON and I was also in the forums at the time, I thought Daz was sending me info about an update for the plugin so I didn't run it. You don't need to type anything if you have saved your login, just click the "Login Browser" button and the browser logs in automatically. May take a little while sometimes, so just wait. "Now that all of the major browser makers are taking security more seriously, you can expect to see security fixes and features implemented more frequently. The final decision about using the browser you think is most secure or most suited to your needs can be made by reading the browser specific security features. Although at present – Internet Explorer is known to be the most secure browser when it comes to blocking Malware." "A browser has two main roles to play when it comes to secure browsing. First, it must protect the user from malicious sites and software. Second, it must protect itself from malicious attacks. Not long ago, Firefox was ahead of Internet Explorer (IE) when it came to the robustness of its design and its ability to protect itself, while IE was plagued with countless vulnerabilities. However, since the release of IE7, Microsoft has narrowed the gap considerably. This is borne out by Secunia's browser security fact sheets . Although there are only results covering the second quarter of this year for IE9 and Firefox 4, IE9 does marginally better. Between the older versions -- IE8 and Firefox 3.6 -- Internet Explorer, again, has had fewer vulnerabilities." "The Carlsbad, Calif.-based independent testing firm tested a group of popular browsers by exposing them to a set of malware URLs targeting European users. The firm said Internet Explorer 8 (IE8) achieved a blocking rate of 90%. Internet Explorer 9 (IE9), the latest iteration of Microsoft’s browser, earned a 100% blocking rate when its application filtering technology was enabled. ...as to the crash whne downloading the history file, not sure why that is happening. Could there have been a recent update that I missed perhaps? I've been managing my history, downloads and udpates by hand but I've finally given up and am thinking about using your tool. Just a quick question I haven't been able to find in this thread: will it tell me which products have been updated? I can't bloody keep track of that anymore >:-( Really, that and the duplicate orders should have been fixed by DAZ some time ago. No, it can't tell you which products that have been updated. But the downloader/installer DAZ is working on should be able to do that. But it can tell you which of the products you own that have been updated to DSON format. Just a note... I love the History Manager, but with this latest version I'm finding a bug that I didn't notice before: specifically that it's not catching a lot of the bundled products that I believe the brevious version DID catch. Fortunately I also keep an excel record of everything and use that as my final reference before hitting buy, but besides the contents of most recent PC extravaganzas, I've so far noticed that the contents of the MIchael Five and Victoria 5 Pro bundles aren't showing individually... for example, when I search for Preppy for M5, it doesn't show at all in the current version's search... and that the contents of the Fantastic Five Westpark collection aren't showing. Until now no version of the History Manager lists the contents of the bundles. As far as I know, Taozen works on a solution, to list the bundled products, by use of the data on my Fun with Bundles page. No problem, DAZ History Manager from Taozen and DAZ History Script from OrcaSoul read and sound very similarly, even if they are for different use. All OrcaTools DAZ Scripts do not seem to work, after the lot of changes at the DAZ pages. My latest news from him was, that he is preparing for an art show. After the 18th of Nov., when the show ends, he will work at the scripts again. Have downloaded version 0.538 of History manager. Keeps crashing on win7 system. Every time i attempt to download history from daz,, program auto shuts down. I can't reproduce that, it works fine here on both XP and Win 7 - 64. If you send a copy of the error log to support @ taosoft.dk I'll take a look at it. Has DAZ changed the DSON page address again? Haven't been able to get a list for over 24hrs, coincidentally from the time Black November kicked off. I am getting a 'not currently available, try again later' message. Hope it's back soon, amazing how I rely on this program now. Yes I had trouble too. They have taken off the written link but if you click here you get to it. click on the shop item first and then you will see the page that has this. I don't know why they would have taken the written links away and made this page much harder for us to find. 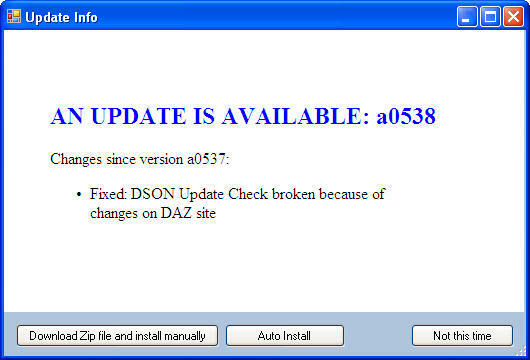 Hi esther, thanks for that but I am talking about the updates list generated by the DAZ History Manager program. I can find the category here but the update functionality in DHM is broken. Last time this happened it was because DAZ changed the page path which DHM uses to check against so I was wondering if it had happened again.